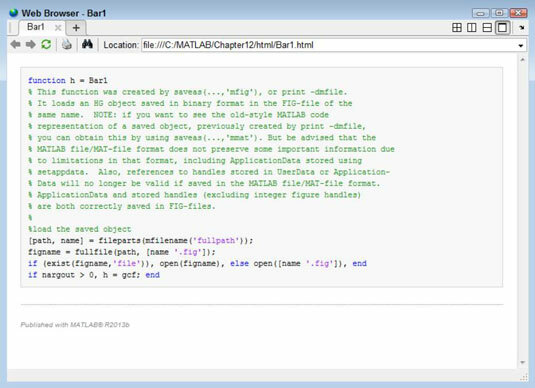 At some point, you want to publish the information you create in MATLAB. Of course, most of the time, you don’t need to publish a matrix or other source data. What you want to publish are the plots you create from the data. A picture is worth a thousand words — you’ve heard the phrase a million times, yet it still holds true. After you finish publishing a script or function in HTML format, you can view it using the web() function. To test this feature, first publish the Bar1.m script by typing publish(‘Bar1.m’) and pressing Enter. After you see the success message, type web(‘htmlBar1.html’) and press Enter. You see the MATLAB browser output. However, even if this output looks perfect, always test the published output using the applications that your viewers will use to ensure that everything displays correctly. You can also use a version of publish() with name and value pair options. This version of publish() gives you the most control over the published output. You can control precisely where the document is saved and the size of any images provided with the output. Here is a list of the options and how you can use them. (default), latex, pdf, ppt, and xml Output Determines the format of the published document. but XML output can accept any of the file formats. the published document. Setting this value to 0 means that no code is in the output. to output directory Output Specifies where to place the published document on disk. You must save your figures to disk if you want to use them the next session. However, saving a figure to disk can also help you publish the information in a form that lets others use the information as well. The format you choose determines how the saved information is used. 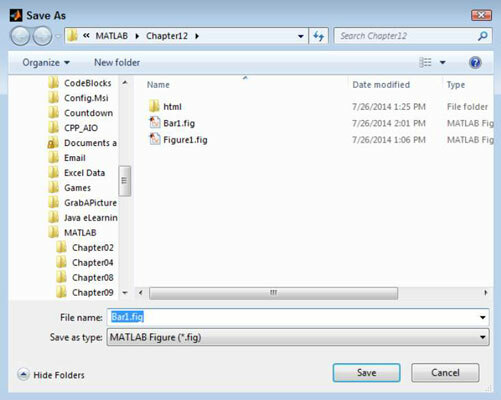 Only the MATLAB figure (.fig) format provides an editable form that you can work with during the next session. To save an entire figure, choose File→Save As in the figure window. You see the Save As dialog box. Type a name for the file in the File Name field, select the format that you want to use to save the file in the Save As Type field, and click Save to complete the process. The command version of saving a figure depends on the saveas() command. To use this command, you supply a handle to the figure that you want to save as the first argument. The second argument is a filename. When you provide a type of file format to use as the third argument, the filename need not include a file extension.